Toronto Mayor John Tory has called for an end of the controversial police practice of carding, which he said has "eroded the public trust." "It is my intention to see carding cancelled permanently and that we start fresh," Tory told reporters at a news conference on Sunday. Tory said he intends to go before Toronto's police board on June 18 and call for the practice to be eliminated. "I believe our police can do their jobs and keep the city safe through...stronger relationships with the communities they serve. 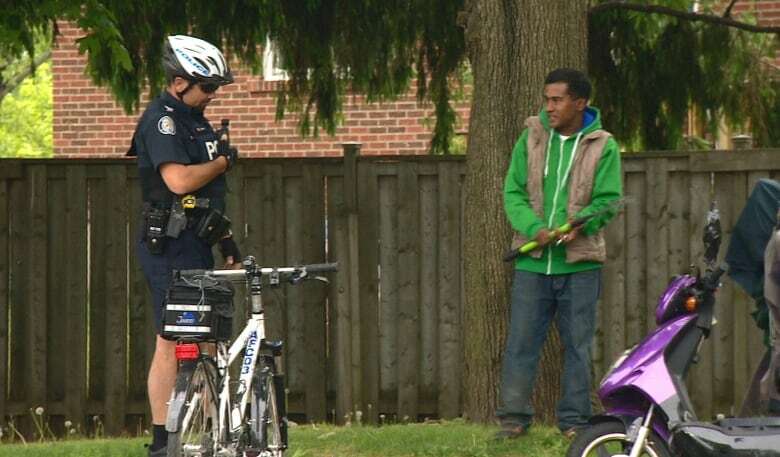 But carding won't get us there," he said. The mayor cautioned that he is only one of the board's seven members, but said he is looking forward to having a discussion on the matter. Debate over the practice — in which police stop and question residents and then record details of the interaction in a database even when no criminal activity took place — has gripped the city in recent months. Critics have said it tends to disproportionately affect young black men and has led to distrust of police. Proponents say it is a valuable tool for police that makes communities safer. Toronto's police union said following Tory's remarks it is "deeply concerned" by the move against carding. "Carding is a proven, pro-active police investigative strategy that reduces, prevents and solves crime," said Toronto Police Association president Mike McCormack in a statement. In January, Toronto's then-police chief Bill Blair placed a moratorium on carding, which remains in place. His successor Mark Saunders has defended the practice, and said in a recent interview with CBC News that police rely on it to keep issues like gang violence in check. But Saunders also said he would put tighter restrictions on carding, and give officers more training on its use. Tory said he had spoken to Saunders about his decision to come out against carding but would not comment further on the chief's response, though he commended his efforts. "He understands what I'm doing and I think he understands why I'm doing it," Tory said. The mayor said police should use other tactics which balance the need for community safety with individuals' rights, but when questioned, he did not offer specifics. Tory said the issue has been among "the most personally agonizing" since he became mayor. "After great personal reflection and many discussions ... I concluded it was time to say, enough. It was time to acknowledge there is no real way to fix a practice which has come to be regarded as illegitimate, disrespectful and hurtful. "It was better to start over." Tory said his discussions included a talk with journalist Desmond Cole, who recently wrote about his experiences with carding for Toronto Life. Cole said he was "overjoyed" with the mayor's move, but cautioned that more action is needed. "This has been a long time coming," Cole told reporters. "Now we have to make sure [Tory] and the police services board and Chief Mark Saunders follow up on this announcement ... so carding is actually ended. So we'll wait and see." Toronto Police Services Board chair Alok Mukherjee said in a recent editorial there is "no justification" for the "deeply offensive" practice to continue. More than 30 prominent Torontonians — including current and former politicians, civil servants and community leaders — spoke out against carding earlier this month.